Home Shop by Category Face & Body Care Bath Products Taylor of Old Bond Street Sandalwood Bath Soap 200gr. Taylor of Old Bond Street Sandalwood Bath Soap 200gr. Taylor of Old Bond Street Sandalwood Bath soap 200gr. Pure vegetable sandalwood soap formulated for sensitive skin. Each bar combines an exotic blend of masculine scents creating a creamy lather that hydrates the skin three times more than a normal, conventional soap but won’t strip the skin of its natural oils. This soap lathers extremely well and leaves a subtle masculine scent on the skin. It is strong smelling but produces a clean, fresh end result. 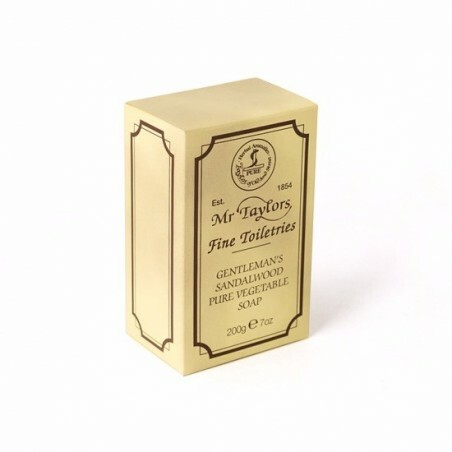 Elegant, discreet sandalwood scent with top notes of geranium, rosemary and liquid amber.